School leaders are always looking forward–whether they’re putting out immediate fires or developing long-term strategies to lead their districts. So, it’s not often that a school district superintendent confronts an issue from seven decades in the past. Just don’t tell Dr. Bill Heidenreich, superintendent for Valley Stream Central High School District in Long Island, N.Y., that. One evening in June, Dr. Heidenreich received a dialogue through Let’s Talk!, the district’s community feedback platform, from local resident Laura Neville. Neville wrote to Heidenreich about her father, William George Houston, a 92-year-old former student at Valley Stream. During a recent hospital stay, Houston’s family had decorated his room with pictures and memorabilia from his life. 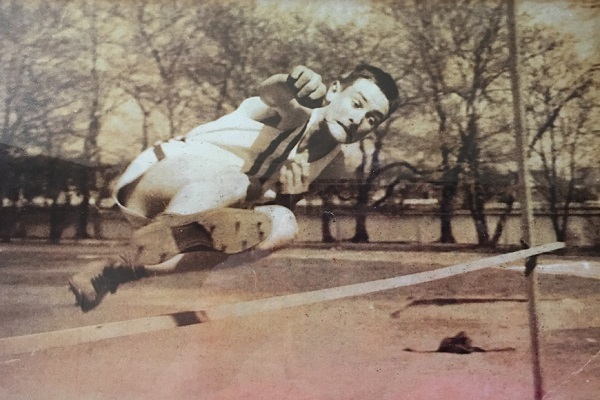 One of those pictures was of a young Houston competing in a high jump competition for his high school in 1943. Houston had won the high school championship for the high jump that year, he told his family, but never received a trophy due to metal rationing during World War II. In her note, Neville asked Dr. Heidenreich if there was anything the district could do to honor her father’s past achievement. After reading Neville’s note, Heidenreich and Neville talked on the phone. Heidenreich told Neville that he would recommend officially recognizing Houston during the next school board meeting. After careful planning, Houston was transported by ambulette to the next school board meeting, the final meeting before summer break. Dr. Heidenreich presented Houston with a trophy, which the district had made especially for him. Houston was cheered and celebrated with a standing ovation. He grabbed the microphone and addressed the community. While Mr. Houston’s family were the main catalyst for the ceremony, Dr. Heidenreich says he might not have known about the story had it not been for Let’s Talk!. That always-on listening advantage helped create a special moment for an alumnus, his family, and his school community. To see the moment when Mr. Houston was honored, check out the full video of the event, courtesy of Newsday. Interested in learning more about how to use Let’s Talk! to help community members tell their story? Sign up for a free demo and consult here. Be the first to comment on "74 years later, a high school athlete gets his due"